Everybody enjoys a public holiday, right? How could you not when it involves getting off from work? In the U.S. public holidays like Presidents’ Day, Memorial Day, and Labor Day generally consist of an unhealthy number of commercials advertising ‘huge’ sales and savings in honor of said holidays. And maybe a parade and barbecue if the holiday takes place in the warmer months. Even the more spiritual/religious holidays seem to have some aspect centered around shopping like Black Friday after Thanksgiving and the entire span of time between then and Christmas. Eventually the holidays lose their meaning. What is Labor Day even about? 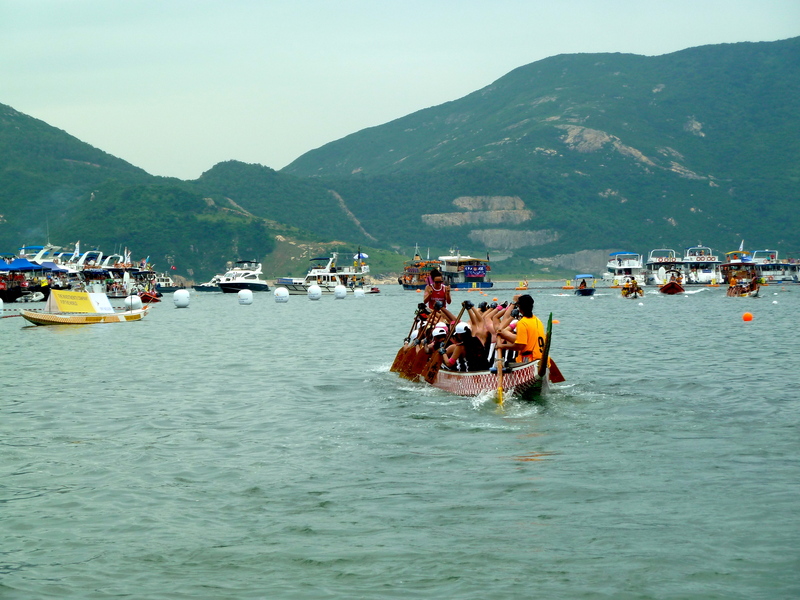 So when I first heard about the Dragon Boat Festival I was completely shocked by the traditions that are still held in Hong Kong and other regions in China. For a city that has an abundance of malls, I was surprised to see absolutely zero advertisements for annual sales in the mall where my work office is located and any other mall I happened to wander in to. The festival occurs on the 5th day of the 5th month of the Lunar calendar, supposedly the day when the sun, representing the dragon and masculinity, is the strongest. This year it was Wednesday the 12th, a nice mid-week break for any stressed out employees. 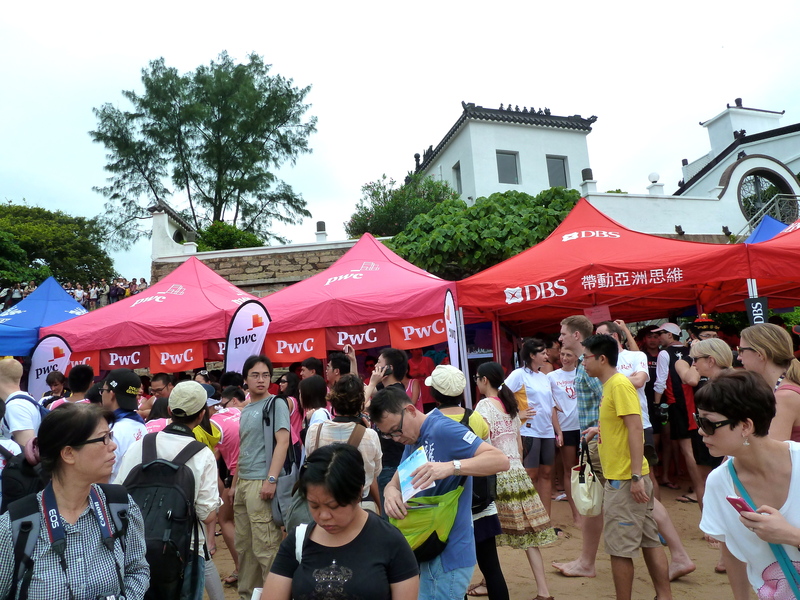 The Dragon Boat festival involves racing canoe-like dragon boats, eating rice dumplings called zongzi, and drinking a special wine. 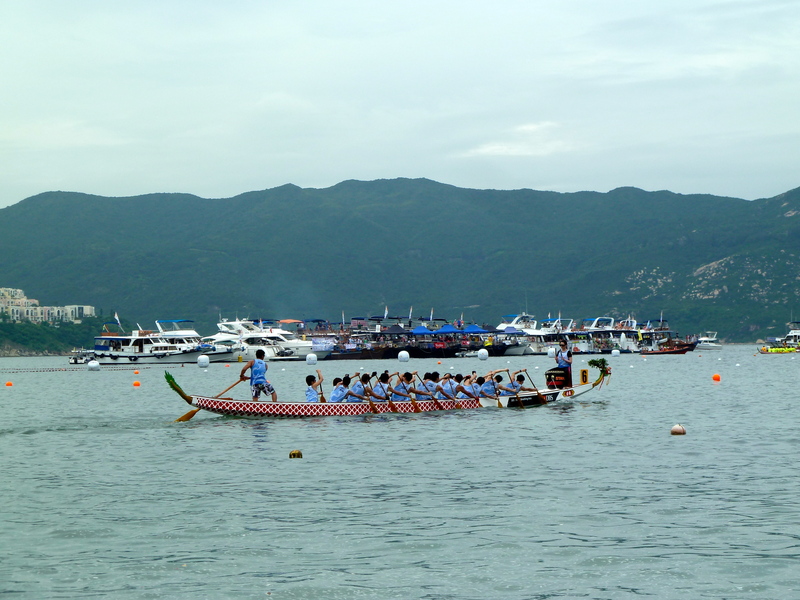 Sadly, I looked up the latter two on Wikipedia because I only observed dragon boat racing. I’m kind of sad that I missed out on rice dumplings because I love trying new foods. There are a few folk legends that are possible origins for the festival. Most of them involve someone drowning, people throwing zongzi into the ocean to stop the fish from eating his body, and people racing out in dragon boats to find their body. I know, so festive. I personally prefer the theory that the festival is rooted in dragon worship. If you’re interested in the legends read the Wikipedia page. For many Hong Kong natives, the Dragon Boat Festival is the time to hide indoors with friends and family because of the crowds that emerge. I don’t blame them. I’m not too fond of crowds myself. However, they always know the best places to catch some races if you’re interested. When I asked my co-worker what he usually did he said he stayed home but told me to go to Stanley Beach, knew which bus to take, and recommended for me to leave at 8am. There was no way I was waking up and leaving earlier than I do to get to work so my roommate and I left around 9:30 to catch the bus to Stanley Beach. When we finally got to line up for the bus, here is what we found. No wonder he told me to go so early! 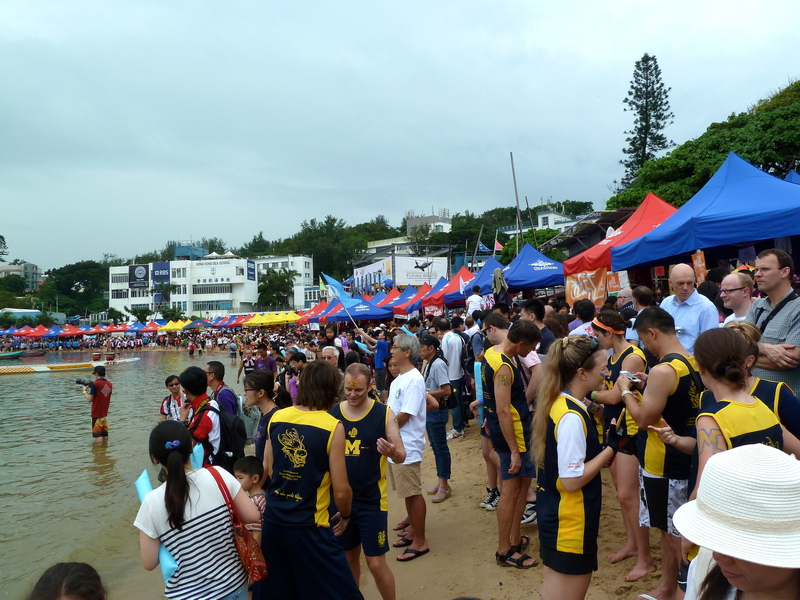 As one of more popular destinations for dragon boat races, the beach was already packed when we got there. I didn’t mean to catch that man taking of his shirt, I promise haha. 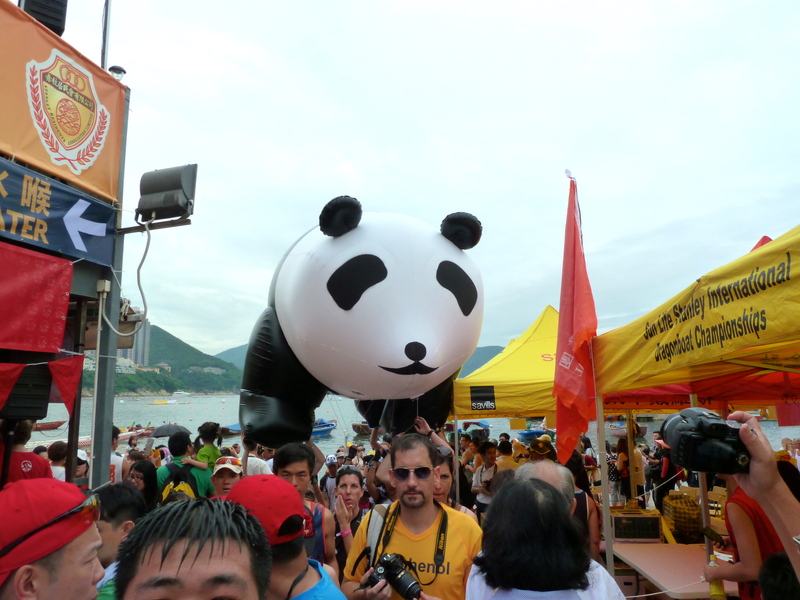 Plus, there was a giant panda balloon! The competing dragon boat teams were made of many company teams, other kinds of community groups (I think I saw a Latino community), and I even saw a team from the University of Michigan. Maybe they were on a study abroad as well. These teams must have trained really hard for this annual event. It did not look like an easy task to steer those boats to the finish line. Each team has a person sitting at the front of the boat beating a drum to synchronize the strokes (kind of like a coxswain in crew?). I was also surprised by how international the teams were. I guess the large number of company teams included a lot of employees that originate from all corners of the world. This was a really different side of the business side of Hong Kong for me since I feel like I’m the only person in my office that isn’t from Hong Kong sometimes. After watching for a few hours we returned again to the Stanley Markets where I did some of my souvenir shopping. 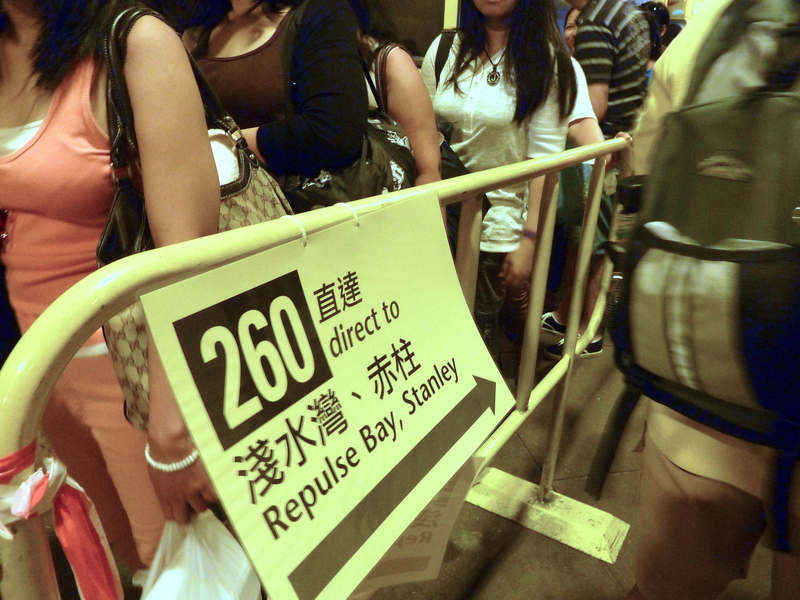 However, a tip for any future Hong Kong tourists/travelers: Do not buy anything in the Stanley Markets. 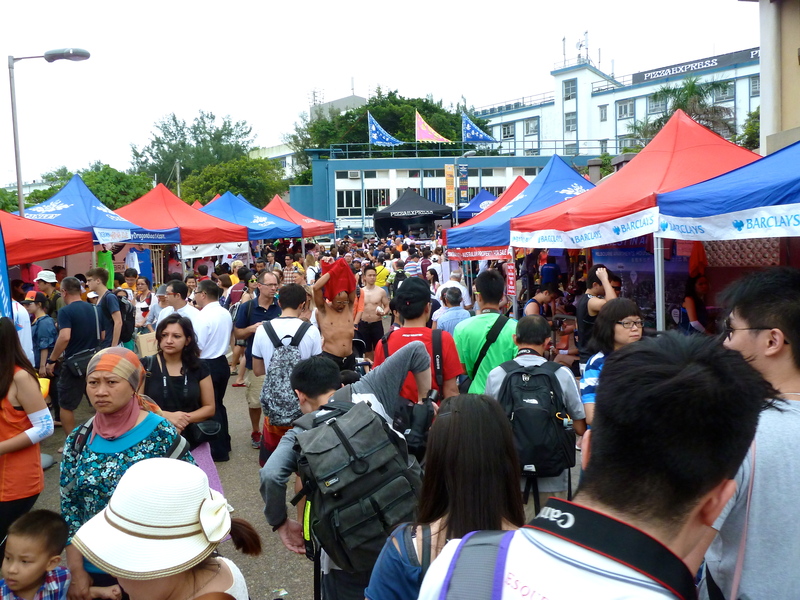 It is a great tourist destination for sightseeing and just to say that you’ve been there, but you can find the same items sold in the Stanley Markets as many of the other street markets in Hong Kong, especially the ones near Mongkok. I made the mistake of buying from Stanley before checking out the other markets (which I did this weekend). Maybe I’ll write a post on bargain hunting in the markets later. The day wasn’t over yet! 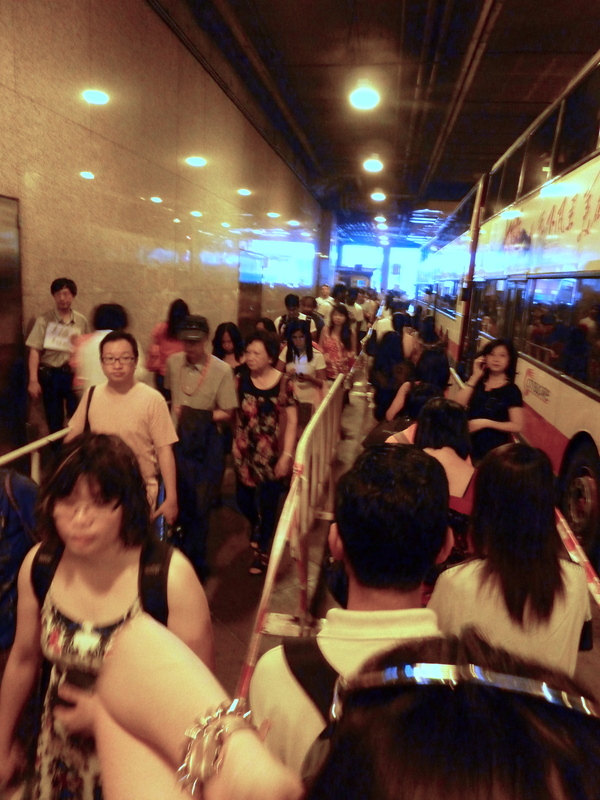 Keep checking back for a post on the Tsim Sha Tsui Promenade, Avenue of Stars, and Symphony of Lights.